Ms. Sarah Beckham and Dr. Gwendolyn Kirk hosted a series of instructor training workshops, demonstrating the concepts of Project-Based Language Learning (PBLL), Flipped/Blended Learning, and core principles of Student-Centered Learning, with a specific focus on how these could be used in the teaching of Less Commonly Taught Languages. In these workshops, 15 instructors applied concepts in the development and piloted course materials and curriculum with colleagues. Additionally, the two conducted class observations and held one-on-one mentoring sessions with participants, offering feedback and strategies for their individual classes. This program was co-sponsored by the Berkley-AIPS Urdu Program in Pakistan (BULPIP-AIPS), which is another Embassy-funded program. 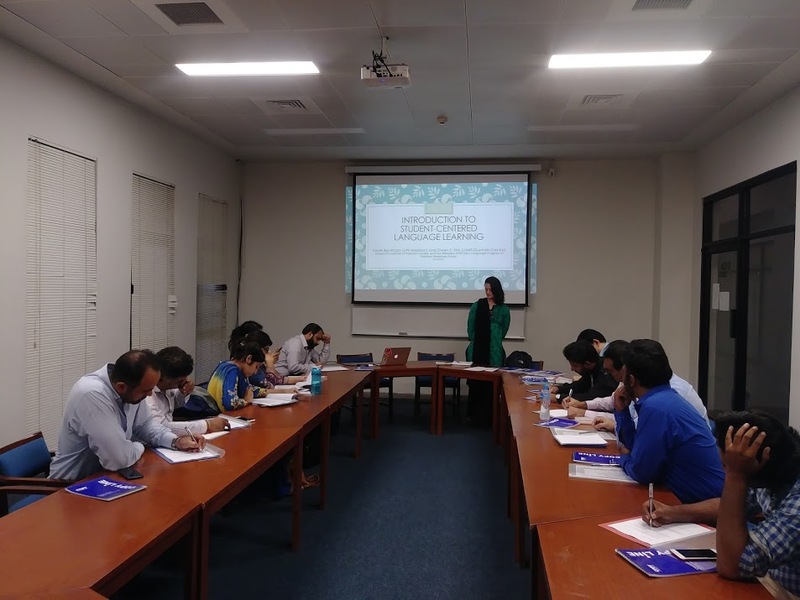 This project was primarily targeted towards the instructional staff on the AIPS-Berkeley Urdu Language Program in Pakistan, but in the participant group of fifteen, Ms. Beckham and Dr. Kirk were able to enlist a diverse selection of other participants as well. The primary component of this workshop was the group sessions. The first session dealt with the themes of student-centered learning and active learning, the second session was focused on blended learning, and the third discussed project-based learning approaches. The goal in all of these was not only to introduce the theoretical principles and evidence-based outcomes of these pedagogical approaches but also to help the workshop participants navigate applying these approaches in their individual institutional contexts. Along with the material covered in the workshops themselves, and in the spirit of the student-centered and blended learning approaches they were espousing, participants were asked to develop individual blended lesson materials at home and then worked collaboratively on improving them over the course of the workshop, including a session of group work and, for those interested, meetings to discuss materials development one-on-one with the workshop leaders. In addition, over the course of three weeks Ms. Beckham and Dr. Kirk set up course observations for all of the LUMS and BULPIP instructional faculty to implement their blended materials for feedback. Sarah Beckham - SASLI, SAFLI, and Project GO Hindi-Urdu Pedagogy Coordinator. She is the Lead Hindi Lecturer at UW-Madison and trained as a theoretical phonologist in South Asian languages, with additional graduate coursework in second-language acquisition and world language curricular design. She is also a core member of the MSU LCTL Partnership project to develop blended materials in Hindi. Gwendolyn Kirk - Assistant professor at LUMS in the Gurmani Centre for Languages and Literatures. Dr. Kirk served for three years as the Program Manager of the Berkeley Urdu Language Program in Pakistan, in addition to her scholarly training in linguistic anthropology and years of research in South Asia. She has taught Urdu at the beginning, intermediate, and advanced levels at Indiana University, the University of Wisconsin-Madison, and at the UW-Madison South Asian Summer Language Institute. She has also worked with the American Councils for Education developing assessment materials in Hindi and Urdu.